Residents near Newtown Creek aren't more likely to get cancer or have birth defects, a new study found. GREENPOINT — A state study that found no elevated rates of cancer or birth defects among residents near Newtown Creek angered local activists who'd been pushing for a more comprehensive review of area health issues for years, they said. Laura Hoffman, 58 and a lifelong Greenpoint resident and activist with the Newtown Creek Alliance, pointed to a troubling disclaimer on the first page of the Department of Health report. "A study of this type cannot prove that a specific environmental exposure caused elevated levels of health problems in a community, nor does it provide information about causes of health problems in individual people," the report states. The warning infuriated Greenpoint residents. "So what did the [Department of Health] think we were asking for? We've always made it clear that we expect [them] to connect some dots," Hoffman said. "I think the real purpose of this is to finally sweep the truth under the rug. "All those years of the state turning their eyes to what's going on and then they say 'well, no problems,'" she said. "It's a disgrace." Using two decades worth of data on births and cancer rates, the state compared health outcomes of residents living within a half-mile of the Newtown Creek with larger populations of Brooklyn and Queens. Researchers found statistically significant increased rates of liver and lung cancer among men and cervical cancer among women who lived close to the creek, though they also found lower rates of other types of cancers. Researchers concluded that the higher rates could be related to non-environmental factors like higher poverty levels near the creek, smoking and alcohol consumption. The poverty rate within a half-mile of the creek was 30 percent higher and the median income was 21 percent lower than levels in Brooklyn and Queens as a whole, according to the report. Between 1988 and 2010, birth defects or severely premature births weren't any more likely near the creek, the study found. Though women living within a quarter-mile of the creek were 17 percent more likely to give birth slightly before usual, between 32 and 37 weeks. A full-term pregnancy lasts up to 40 weeks. Still, researchers, who couldn't isolate for socioeconomic status or racial or ethnic variables because they said that data wasn't available, concluded that the higher rates were likely due to "socioeconomic status and associated psychosocial factors." "When people living near a Superfund site are diagnosed with cancer, they tend to assume — understandably so — that it’s caused by environmental exposure. But cancer is a very common illness," said Department of Health spokesman Steve Flamisch. "It takes a study like this, comparing actual to expected numbers, to tell people whether their community really has a cancer problem." Instead of tabulating data however, Hoffmann and the community had been asking for a cluster study where researchers polled families going door to door so as to capture a broader range of health impacts like autoimmune diseases, or potentially different types of cancers within the same household. Hoffmann's father died of Progressive Supranuclear Palsy, a rare brain disease, her mother of Central Nervous System Lymphoma, a type of brain cancer, and their dog also died from a brain disease, she said. Hoffmann now suffers from an autoimmune disorder similar to lupus, she said. "I know from what I've witnessed that the community did indeed suffer health impacts not captured in this document," she said. 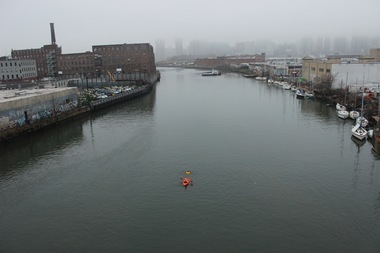 The state will defend their findings at the Newtown Creek Community Advisory Group's next public meeting at the Polish Slavic Center at 176 Java St. on May 4 at 6:30 p.m. The location of the meeting has not yet been set but you can check back on the their website for updated information.